Anomet Products is the leader in the production of innovative clad wire products. 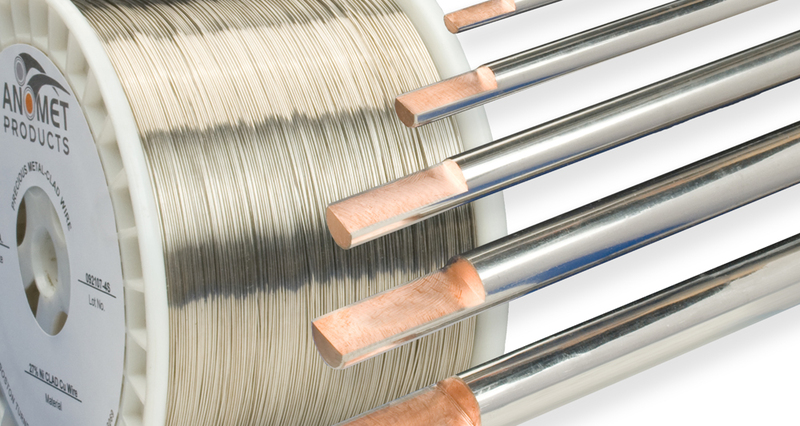 Anomet's engineers utilize this unique clad wire technology in their line of Nickel Clad Copper (KULGRID®) wire and rods, bonding pure wrought nickel to copper. The result is a complete metallurgical bond between materials, thus allowing full ductility at all diameters. Bending, shaping, stamping, and other types of forming are all possible with Anomet Nickel Clad Copper. Suitable for any application where high conductivity rod or wire is needed, Anomet Nickel Clad Copper also resists oxidation at elevated temperatures and has all the corrosion resistance of pure nickel. Available from 0.010" ø to 1" ø in a standard 27% nickel ratio with a conductivity of approximately 70% IACS. With our unique processing, other nickel to copper ratios are also available. Custom configurations may also include the use of nickel alloys and/or alternate brass/bronze/steel based core materials. Anomet Nickel Clad Copper is available packaged in rods, coils, or spools depending on customer requirements. Anomet also offers complete metallurgical services to insure product quality. Call or email us for more information, pricing, or samples. KULGRID® is a trademark of Osram Sylvania.